If you go out very early in the morning, before the dew has dried on the grass, you might find a bit of fairy lace, left behind by a garden fairy hurrying off at the first light of dawn to hide beneath the shrubs or in the shade under the leaves of cucumber vines in the vegetable garden. Later in the morning, the lace disappears. Who knows who or what comes and takes it away, it just disappears as the sun dries the dew on the grass. I've never seen a foxglove without the spots, so I'd recommend planting foxglove in your garden if you want to make sure to attract garden fairies. How does a coreopsis bloom (Coreopsis lanceolata) end up in the middle of a drift of coneflowers (Echinacea purpurea)? There can be only one answer. The garden fairies put it there, to play a trick on the gardener. Then they hide and watch and laugh when the gardener comes out, and upon seeing the flower, scratches her head and says out loud to no one in particular, but loud enough for the fairies to hear, "Now, how did that flower get in there?" If the gardener is really quiet, she might even her the slight tinkle of a fairy's laugh. Whimsy in the garden is really in the mind of the gardener. Or it may be in a fairy garden, filled with miniature plants, a few small garden ornaments, and a door for the garden fairies to come in out of the rain and cold. With all of this evidence, how can one dispute the notion that garden fairies are here in the garden, bringing their own brand of mischief and making sure the gardener doesn't get too serious about it all? And if you listen to the garden fairies, they'll give you some good advice about how to make the garden a place that both you, and they, will love. With their permission, since it was their guest post, I'll repeat some of their advice here. 1. Don’t keep the garden too neat and tidy. If you try to keep things too tidy in the garden, you’ll drive yourself nuts with all the weeding and deadheading and you won’t enjoy the garden as much as you should. And you’ll remove a lot of good plant debris that we garden fairies use to make our houses and clothes, that birds use for their nests, and that microorganisms break down to enrich the soil. When you do clean up the garden a little bit, put the plant debris in a compost bin, please, and we’ll make sure you get good compost from it. 2. Get out and observe your garden year around and around the clock. The more time you spend in your garden, the more you learn about it. We think the more you learn about your own garden, the better you make it for us garden fairies. You observe where the sun shines at different times, what areas are wetter than others, where you need more plants and more. We promise to leave you alone, most of the time, as you wander about in your pj’s in the early morning. That is, we promise to leave you alone as long as you give us some space, too. As we make our way home after a night of partying about in your garden, we aren’t always as sharp and on the look out as we should be. And perhaps we might have a tiny bit of a hangover, too, if you know what I mean, so we can be grouchy in the morning. So just leave us alone if you see one of us. 3. Try to have flowers blooming as much as you can throughout the year. We garden fairies love flowers and generally settle in gardens where we know they’ll be a good, steady parade of blooms through spring, summer, and fall. Then in the winter, if we happen to live in a midwestern garden like Carol’s, we’ll sneak inside and play amongst the blooming houseplants or write an occasional guest post. Yes, we do sometimes envy our southern cousins who get to play in gardens outside all year long but it does get quite hot for them in the summer. Anyway, try to grow as many flowers as you can. 4. Lay off the pesticides. Those chemicals don’t just kill off the pests, they can take out the bees and garden fairies, too. Have you ever seen a garden fairy who didn’t run away fast enough when someone started spraying that stuff and got soaked with it? It’s just an awful sight! If you saw it once, you’d figure out other ways to get rid of those pests in your garden. 5. Mix it up in the garden with lots of variety. We like trees and shrubs for shade, along with flowers and foliage plants, maybe even some tall grasses and a bit of lawn. Oh, and we like lots of ground cover to nap under in the afternoon. And don’t forget to find a spot for a vegetable garden. We garden fairies don’t just sip flower nectar all night long, you know, we get hungry for real food, too. And we promise we’ll only eat a tiny bit, never as much as the rabbits eat. Aren't those rabbits just like pigs in the garden? And it is so funny to watch Carol try to chase them out of the garden! Thank you to Gardening Gone Wild for hosting the Garden Bloggers' Design Workshop each month and for choosing Whimsy in the Garden as the July topic! Great post Carol. It's good to know I'm not the only one out in the garden early in the morning in my pjs. lol Your fairy garden is really cute. Funny, you got coreopsis bloom in the middle of coneflowers? I am a new gardener and have you beat, I bought a watermelon seedling, after waiting and waiting for my watermelon guess what I got? A red okra. I didn't even know there was such thing. Do garden fairies like red okra? I love the lace in particular, Carol -- such a darling post, and the fairies offer such excellent advice! Well said, fairies. And Carol, how lucky you are to have foxglove still in bloom--mine's been done for more than a month, and I miss those little footprints. Delightful post Carol. You put the wim in wimsy. Those garden fairies are so smart. They give such good lessons. We should all pay attention. I do believe that lace could serve as a little fairy hammock! 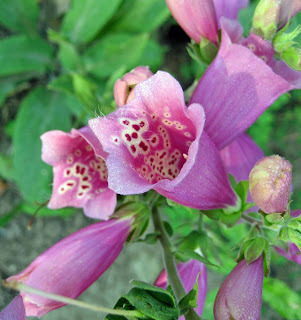 The foxglove is really lovely...and thank the fairies for a fun and information packed post. I must have a bit of fairy in me because I do love foxgloves, all the more so because growing them here is such an iffy proposition. I see them in nurseries and sigh longingly, just as I did when I saw their picture in this post. Maybe I'll try them again someday. Maybe. I love the fairy garden! Do you have a fairy-sized hoe for it? The fairy's advice is definitely worth following. I love this post, and I just love your fairy garden. What a wonderful idea! What a lovely post and a lovely garden. I can see why fairies feel right at home there. I grew up with the fairies. Ever heard of Rupert? He was a character in a Daily Express cartoon and was always visiting the fairies and the pixies. Maybe that's why I like those foxgloves, but alas I have had no success with them in my garden, or the harebells that they use for their hats. It's fun to read about your fairy antics though. 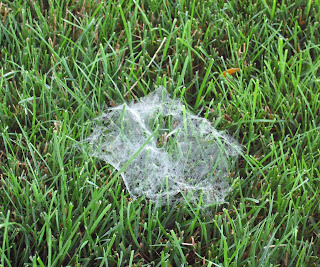 Last year I had quite a few 'fairy' webs but this year, not too many although it has been dry until yesterday and we are not at 3.40" of rain. It looks quite relieved in the garden. 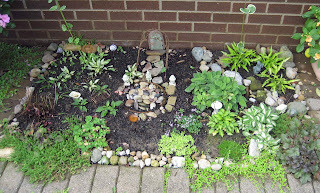 Enchanting post :-) And I love your little fairy garden. I'll be expecting some over in my garden soon, because it sure isn't neat and tidy at all, lol! Great post, Carol and the garden fairies. They're wise creatures...glad they're enjoying your garden as much as you are. What a cute post! I love the first picture. I've seen those on the grass in the morning and never given it a second thought. I may have to teach my kids about that! I love your idea of "fairy lace," Carol - and here I thought they were ordinary old spider webs. That's what I get for not paying attention! Now that you've let us know the signs of fairy activity to watch for, I realize that I must have quite a few here too, and I'm thinking I'd better start showing them a bit more respect.